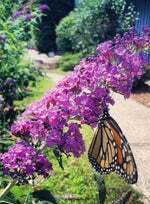 The Magic: How the Butterfly Bush works: Buddleia or Butterfly Bush has been a sensation in American gardens for years, and no wonder. This plant is easy to grow, blooms profusely, and has that magical quality: Butterflies can’t resist it. Here's why: It’s not just the pretty flowers that attract the butterflies, like any bright flower. 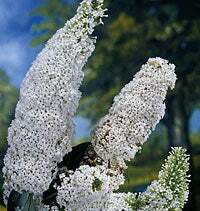 Buddleias emit a special honey-scented fragrance that lures butterflies like a moth to a light, and then once there, they find the flowers super-rich in nectar. A butterfly bush in the garden will often be seen with a mass of butterflies on the flowers, especially during hot sunny afternoons. 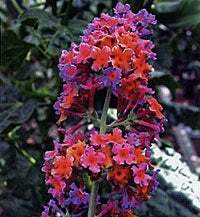 Buddleias attract other insects too, like moths, and the reddish ones strongly attract hummingbirds. So it’s more than a name; it’s actually a botanical phenomenon.